How the Khufu Great Pyramid was Built ? What is the "common theory about how the pyramid was built ? To begin with , we should mention that the common theory has no historical evidence to support it . Many Egyptologists claim that there are no ancient Egyptian records from any period , which describe how how the pyramids were built . their error is that they have predetermined the construction method and are only seeking the records to affirm their theory . 1 - The pyramid's core was built mostly of quarried local limestone blocks which were cemented by a paper thin layer of mortar . 2 - The core masonry was originally faced with fine-grained limestone , which was quarried from Tura on the east bank of the Nile and ferried across the Nile to the Site . Herodotus the Greek historian (c.500B.C.0 provided a historical account of how the pyramid was built .remember that the pyramids were at least 2,000 years old at that time and Herodotus was listening to an Egyptian priest , telling him about events which were , handed down by word of mouth , for sixty generations . Herodotus neither mentioned the source of the core masonry as local limestone nor that the pyramid blocks were carved . he stated that stones ( not necessary quarried blocks , but possibly stone rubble ) were brought to the site from east side of the Nile . Her are excerpts from Herodotus's' account : " The work went on in three-month shifts , a hundred thousands men to a shift . It took ten years of this oppressive slaves labor to build the track a long which the stone was hauled - a work in my opinion , of hardly less magnitude the pyramid itself : for it is five furlongs (330ft=5/8mile) in length , sixty feet wide , forty feet high at it highest point , and constructed of polished stone decorated with carving of animals . "To build the pyramid itself took twenty years "
"This pyramids was built thus ; in the from of steps which some call crosae , and others call bromides . After preparing the foundation , they raised stones by using machines made of short planks of wood , which raised the stones from the ground to the first range of steps . On this range there was another machine which received the stones from the ground to the fist range of steps . On this range there was another machine which received the stone upon arrival . Another machine advanced the stone on the second step . Either there were as many machines as steps , or there was really only one m and portable , to reach each range in , succession whenever they wished to raise the higher . I am telling both possibilities because both were mentioned . " I am confused about Herodotus ' statement that " they raised stones by using machines made of short planks of wood ". The Greek word , mechane , used by Herodotus , is a non-specific term indicating a type of advice . A machine made of short planks of wood , does not make too much sense . Many people ridiculed Herodotus for this description . it was actually the poor translation that caused the confusion . The translators have distorted the meaning of the Greek word , when they gave it a specific modern-day meaning . "... They raised stones by using molds made of short planks of wood , which raised the stones from the ground to the fist range of steps . On this range there was another mold which received the stone (rubble ) upon arrival . Another mold advanced the stone on the second step . Either there were as many molds as steps , or there was really only one , and portable , to reach each range in succession whenever they wished to raise the stone higher . I am telling both possibilities because both were mentioned "
A mold can be considered as an apparatus or advice . If Herodotus was not familiar with the term 'mold' , he therefore used the more general term , 'mechane ' . It makes sense , but i am nit totally convinced . So , are you saying that the stones here are man-made just like the stones in all previous pyramids ? Yes , as we discussed earlier , when we were as Saqqara , ancient Egyptians a had the know-how ti manufacture , hard stones . This was evident in the 40,000 items of stone artifacts which found underneath Zoser's Step Pyramid . manufacturing high quality limestone concrete blocks was another application of their highly advanced chemical and metallurgical knowledge . 1 - The Great Pyramid contains approximately 2.6 million building blocs , weighing from two to seventy tones apiece . 2 - Almost none of the pyramid blocks match the Giza Plateau chemically or mineralogically . 3 - The bedrock of the Giza Plateau is made of strata , while the pyramid blocks contain no strata . 4 - Geologists and geochemists cannot agree on the origin of the pyramid blocks . German geochemists' research showed that the properties if the pyramid blocks match those of at least twenty different quarries all over Egypt . Their finding shatter the common theory that the core masonry of the pyramid was quarried from local bedrock . 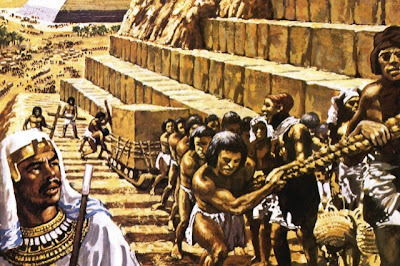 On the other hand , it is preposterous to think that the blocks were hauled from sites hundreds of miles a way from the pyramid site . In other words , the quarried stone blocks theory contradicts the physical evidence . 5 - Natural stone consists of fossil shells which lie horizontally or flat in the bedrock , as result of forming sidemen tray layers of bedrock over millions years. The Blocks of the masonry pyramids of Egypt show jumbled shells which is indicative of man -made cast stone . in any concrete ,the aggregate are jumbled m and as result , cast concrete is devoid of sedimentary layers . These pyramids consisted essentially of fossil shell limestone , a heterogeneous material very difficult to cut precisely . 6 - There are about ten standard block lengths throughout the pyramid .Similarly , limited numbers of standard sizes apply in other pyramids , as will carving such highly uniform dimensions is impossible . However having standardized concrete forming molds is a more logical conclusion . 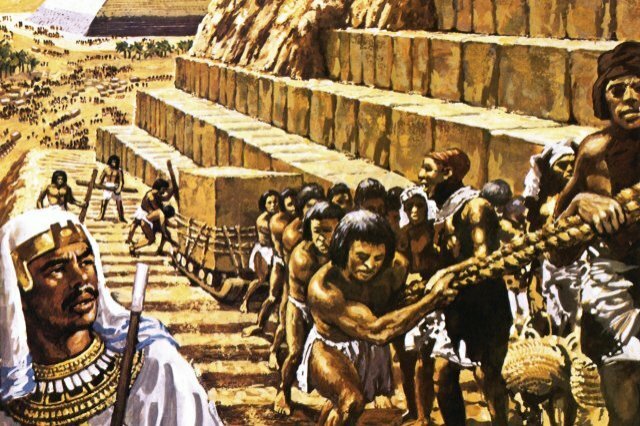 7 - It was found that the longest blocks in the pyramids always have the same length . This is extremely strong evidence in favor of the use of cast stone . 8 - Strata and defects make it impossible to cut stone to perfectly uniform dimensions . 9 - Copper tools ( which are soft metal ) , used by Egyptians at that time , cannot cut large granite or millions of limestone blocs , in a span of twenty years . 10- Limestone frequently splits during cutting . Faults and strata in bedrock assure that for every blocks cut to standard, art least one will crack or ve improperly sizes during quarrying . Given the many millions of blocks of all these pyramids , there should be millions of crack blocks lying nearby or somewhere in Egypt , bit they are nowhere to be found . In short , no rubbish id cracked blocks means no quarrying . Ancient historians , who documented their visits to Egypt ,have no mentioned heaps of broken blocks . 11- The scientists found that the bulk density of he pyramid blocks is 20% lighter than the local bedrock limestone , Cast blocks are always 20-25% lighter than natural rock . because they are full of air bubbles .